Of course, what they mean is don't help the individual; help only corporations by giving them significant tax breaks and low-interest loans. The Federal Reserve last week approved a $200 billion loan program at significantly less than market rates to aid the nation's largest banks. It has also created an almost unlimited credit line for the top 20 struggling investment firms. This past Sunday, it approved a $30 billion credit line to allow financial giant JP Morgan Chase to take over failing financial giant Bear Stearns. Less than a year earlier, Morgan Chase was the recipient city and state subsidies of more than $750 million over a 15 year period; with assets of about $1.6 trillion, it is the nation's third largest financial institution. The $236 million sale, brokered and sanctioned by the Fed and the Department of Treasury, includes Bear's New York skyscraper and about $30 billion in assets of a company days from filing bankruptcy. Bear's stock one year ago was about $170 a share; Morgan Chase paid just $2 a share. As many as one-third of Bear's 15,000 employees, and several thousand of Morgan Chase's 175,000 employees, are likely to be laid off in the acquisition. 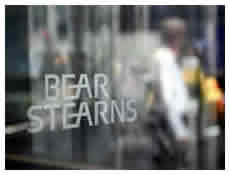 Twice in the past three years, Fortune magazine rated Bear Stearns as the nation's “most admired securities firm. The 85-year-old company had survived the Great Depression of 1929 and several recessions; it couldn't survive the current recession, the one George W. Bush doesn't believe exists. Bear's problems, like that of dozens of major lenders, stemmed from aggressive sub-prime lending practices. About $1.3 trillion of sub-prime loans is still outstanding, according to the Center for Responsible Lending. The materialistic greed of two years ago, which led to inflated stock prices, has become the financial panic of George Bush's last year in office. That isn't much consolation to all Americans who are paying more than $3 a gallon for gas, or to the 7.4 million Americans who are unemployed, the two million Americans who were forced to declare bankruptcy the past two years, or the one million Americans, most of whom have unblemished work histories, who have already lost their homes—none of whom are beneficiaries of the government's corporate welfare system.